The League Management Company (LMC) has revealed that Nigerian Professional Football League (NPFL) outfit Lobi Stars will represent Nigeria at next year’s CAF Champions League (CAF). The confirmation came via a statement from the NPFL custodian on Friday evening, detailing the various decisions made during an emergency meeting between the body and club owners in Abuja on Thursday. According to the LMC, the decisions made during the meeting were prompted by the inability to finish the current league season, which stopped at Matchday 24. At the end of the aforementioned matchday, Lobi Stars led the league with 43 points ahead of nearest challengers Akwa United (41 points). LMC also added that the decisions made have been approved by the Nigeria Football Federation. 1. Upon consideration of different options (5 possible options were presented), it was unanimously agreed by the 20 NPFL Clubs, that the 2017/2018 season of the NPFL is deemed concluded and the team at the top of the standings – Lobi Stars shall be the representative in the CAF Champions League for 2019 Session starting Nov 2018 to May 2019. 2. No team shall be relegated from the NPFL for 2018 Season. 3. Four Teams shall be promoted to the NPFL from the Nigeria National League (NNL) from the ongoing 2018 season to compete in the 2018/2019 NPFL season. 4. 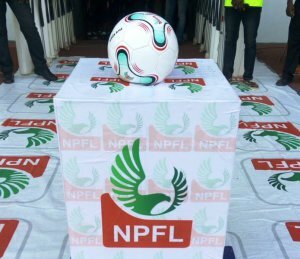 The 2018/2019 NPFL season will commence in November 2018 with a total of 24 participating teams, which shall be divided into two groups of 12 teams each. The 2018/2019 Season commencing November 2018 will be played on 22 Match days ending with a Play off to determine the Winner by May 2019. 5. Three teams from each group (a total of six) will be relegated from the NPFL after the conclusion of the 2018/2019 season, while two teams will be promoted to the NPFL from the NNL 2019 Season. This will allow the NPFL to revert to its normal structure of 20 teams as from the 2019/2020 season.